My hair was very dry and a bit damaged due to all the chemical services I did for the past one month so I had to go back to my favorite hair salon : SALON VIM to fix it! Not very obvious in this picture, but my hair’s super hard to manage and the ends were very dry! She’s like OKAY NO DYEING OR PERMING YOUR HAIR TODAY!!! I’ll only help you trim and do treatment. This time she used 3 shots which target my dry ends! It’s my 3rd time doing this treatment so far and I’m still loving it. It really helps to soften my hair and makes it more manageable. Waiting for the first step treatment to set in before hair wash. Did I mention I love the head massage there???? I secretly didn’t want my hair wash to end cos the head massage is really relaxing. I’ve got a stiff neck due to all the late nights I have with my laptop so I’m always looking forward to massages! And here’s the final result…. My hair is a lot more manageable, more bouncy and lighter! Fiona always does an amazing job to my hair and I always leave Salon Vim feeling SUPER satisfied. So glad that my hair is healthier-looking and lighter now!!! QUOTE “SOPHIA” TO GET 10% OFF AT SALON VIM. And here’s how you can contact them to book your appointment. Don’t wait or hesitate cos they are gonna be super busy since it’s end of year now! I’m back to introduce to y’all another online store! If y’all don’t know what it is, y’all haven’t been checking out my side banners! for quality apparels & accessories for females. It has a clean cut look and the webstore is very easy to navigate. 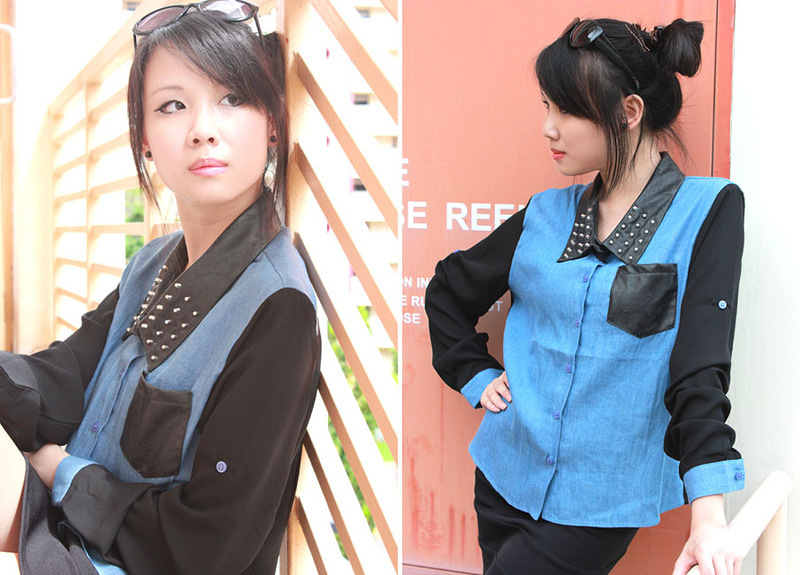 I love the combination of denim and black chiffon. Would match it with a pair of denim pants to enhance the look! And this is totally perfect for christmas/cny. Cannot emphasize how much I’m into peplum now and this top a bit flared at the bottom so me likey!! They have also launched their new collection so grab your xmas goodies now! DON’T FORGET TO LIKE THEIR FACEBOOK PAGE HERE FOR MORE INSTANT UPDATES AND PREVIEWS! Join their mailing list to get free normal postage, and free registered postage when you buy 3 items up! Kirk’s 22nd / People I love most. LIFE CHANGING SKINCARE WITH ALBION!